It is requested that all potential new practice members fill out the new practice member application form as completely as possible. It is also important to bring in a form of ID as well as any insurance cards that you would like to have a complementary benefits check run on. The second step is to sit-down for a one-on-one consultation were you will be free to address any health concerns and goals that you may have, as well as addressing any past damages and traumas you may have endured that will help us address the cause of your health concerns. A comprehensive chiropractic evaluation and Neurological Diagnostic Testing will be performed to further determine the exact cause of your health problems. Using our state-of-the-art diagnostic equipment to locate the root cause of any dysfunction or disease within your body. Other orthopedic, neurological, and physical exams will be performed. New practice members can expect some minor twisting and turning when physically possible. The Doctor will advise you if there are any necessary further examinations or X-Rays that will need to be taken based on initial exam findings. A “Doctor’s Report of Findings” will be conducted where Dr. Bartlett will be able to show you the cause of your current health condition. He will then discuss with you if you are a good candidate for chiropractic care and all his findings and recommendations for your care, as well as action steps to reach your health goals. Our next step is to get you started on your path back to health and healing the way God intended by providing you with the most specific, scientific, chiropractic adjustment around. At ADIO, we believe that you deserve the best care possible, thus giving you the best opportunity to be healthy. 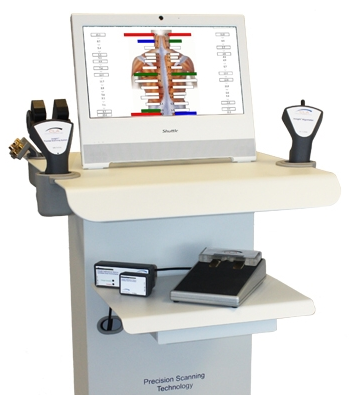 That is why Dr. Bartlett provides this NASA certified technology to achieve the best assessment of your nervous system and how your body is functioning from the inside-out. This assessment tool is not only great for Dr. Bartlett’s assessment, it is also a fun tool to see and monitor the progress you are making and the healing you are achieving.